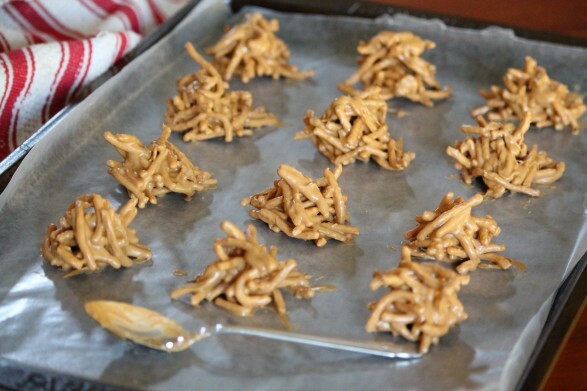 Butterscotch Haystacks are, without a doubt, my younger son’s favorite cookie. I always make them over the holidays and he frequently requests them throughout the year. When his science class organized a nature-themed bake sale, I started thinking of the various ways we could have fun with that. But he knew exactly what he wanted! He was a clever thinker! I never would have considered these salty-sweet treats as nature-related. But a haystack is a haystack. We live in farm country. Why would I not have thought of that? For a little added fun, we made pitchforks by melted a little chocolate and putting it in a zipper-top bag. By snipping a tiny piece off the corner, the chocolate may easily be piped onto wax paper. If the chocolate is too runny once melted, allow it to sit at room temperature, or refrigerate very briefly, until it is slightly firmer and easy to pipe. A longtime holiday favorite in our house, we make these with both ramen noodles and corn flakes. Ramen noodles are a favorite for their extra crunch and the salty-sweet flavor they provide. For a chocolate version, substitute chocolate chips for the butterscotch chips. Stir in some salted peanuts as as tasty option. Yields 2 1/2 to 3 dozen. The recipe may easily be doubled. Line two baking sheets with parchment or waxed paper. In a large, microwave-safe bowl, heat the butterscotch chips in the microwave in 30-second intervals, stirring in between, until melted and smooth. Stir in the peanut butter until well blended. Add the chow mein noodles. Toss gently until thoroughly coated. Drop by rounded tablespoonfuls onto the prepared baking sheets. Haystacks will firm up as they cool. Double boiler option: Melt the chips over simmering water, stirring until smooth. Remove the pot from the heat and stir in the peanut butter. Transfer the mixture to large mixing bowl. Add the chow mein noodles and proceed as above. The haystacks generally firm up nicely at room temperature. If it is warm, transfer to the refrigerator. I like to store them in the refrigerator where they will keep for several weeks…not that they are likely to last that long! These cookies freeze well, too. Love your version, Pat! These are Christian’s favorite cookie so he might be popping over your way for a new twist! Looks so yummy. You can also use fiber 1 cereal. We do this in our weight loss support group (TOPS) by using fiber one & semi sweet or dark chocolate chips melted, then mixed with the fiber 1. These are my favorites! I have called your mother in law many times over the years to get the recipe! When Rod and I lived in FL – they were a big hit with our Navy crowd. I’ve always used corn flakes – I’ll need to try it with the chow mein noodles! You and Christian, both: ) I started making them with the ramen noodles for the salty-sweet combination and the extra crunch. There was no going back! 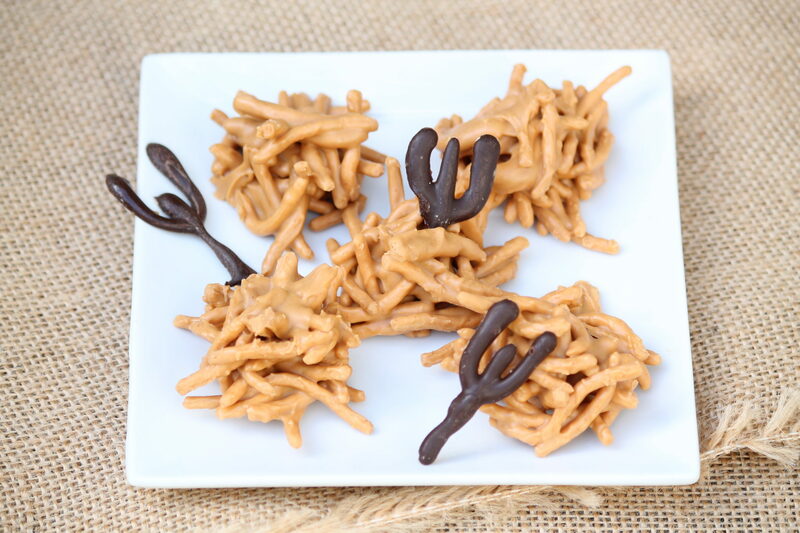 I made these over 50 years ago with equal amounts of chocolate chips and butterscotch chips with chow mein noodles. So good. A classic! I love the chocolate version, too! Trying to think of something different this year to make for our family get together. I like to have a variety of goodies to nibble on while we are waiting for everyone to get here. Can’t wait till I get these made. I can almost taste them now. Wish me luck, this is the first time I have used the microwave to melt my butterscotch chips. Merry Christmas to you, too, Mary…enjoy!! Do the corn flakes not get soggy when mixed in the liquidity butterscotch? Although it seems as if they would, they don’t. If you try, I hope you enjoy! Can I use the noodles that come in the ramen noodle packs or are chow mein noodles different? Good question, but they are different, Valerie. Chow mein noodles are often sold in a 5-ounce can, sometimes a larger bag, and La Choy is a typical brand. They are crunchy, a bit salty, and some people use them on salads as they would use croutons. Hope that helps! I love how easy they are, too, Vickie…and they always disappear quickly! So glad you like! Can you substitute straight pretzel sticks for the chow mein noodles? I haven’t tried these with pretzels before, Cindy, but I love the idea and want to try myself!